We have successfully completed our first whole week of the A-Z Baking around the World and beginning the second week. 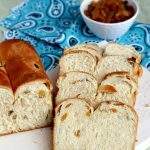 After changing my list a couple of times, I finally settled on this Hot Cross Buns for the alphabet H. Hot cross buns are very famous yeast buns with raisins or currants in them. 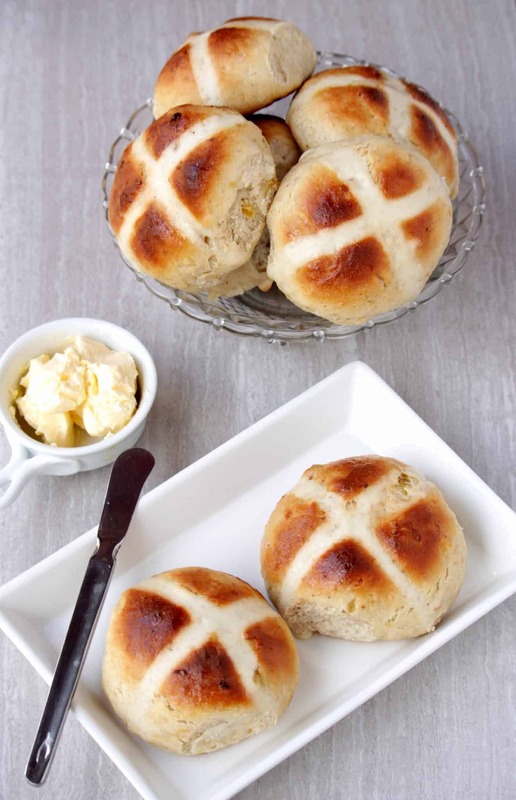 Hot cross buns are eaten on Good Friday in many countries including England, Australia, Canada, India, New Zealand, South Africa and some parts of America. The cross on the bun symbolizes the crucifixion of the Christ. 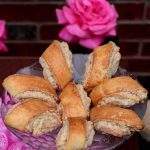 There are many stories about the buns and some are dated as far back as the 12th century. The Hot cross buns were sold only during the week of Easter. As they became popular, they are being sold and made year around. I relate to the Hot cross buns with the popular Nursery rhyme that I learned in my elementary school. 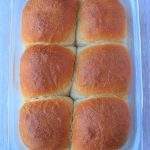 Since this buns is popular in many countries, I chose England as the country that I am going to label it under. 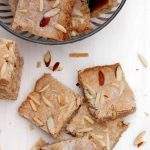 When researching for recipes, I found many different ones with minor changes. Some were heavily spiced and some were just basic ones. Also the cross was made by either a flour mixture or using icing sugar. 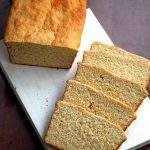 I worked with the recipes and made something that my family would like and yet kept it as traditional as I could. It feels very good to be posting this recipe right around the Easter time. I also chose to make it egg less and used sour cream as my egg alternative. The dough was very basic and I used some spiced milk to make the dough. In a sauce pan, add the milk, butter, cloves and cardamom and heat it until the butter melts. Let it cool down to lukewarm temperature. 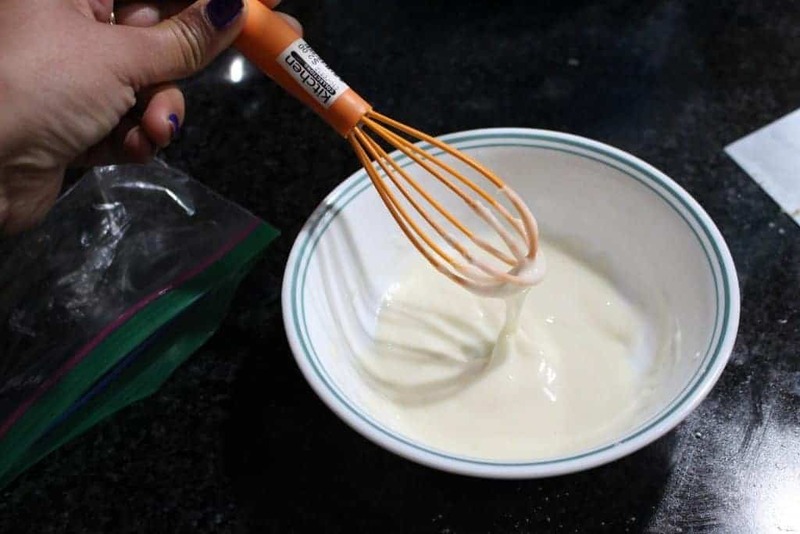 Strain the milk and use it in the dough. I made the dough in my food processor. Add the flour, salt, sugar, instant yeast, raisins and spices to the bowl of the food processor. Add the sour cream and give it a mix. Now add the lukewarm milk to the flour mixture and form a soft dough. If needed add a little more flour or milk. 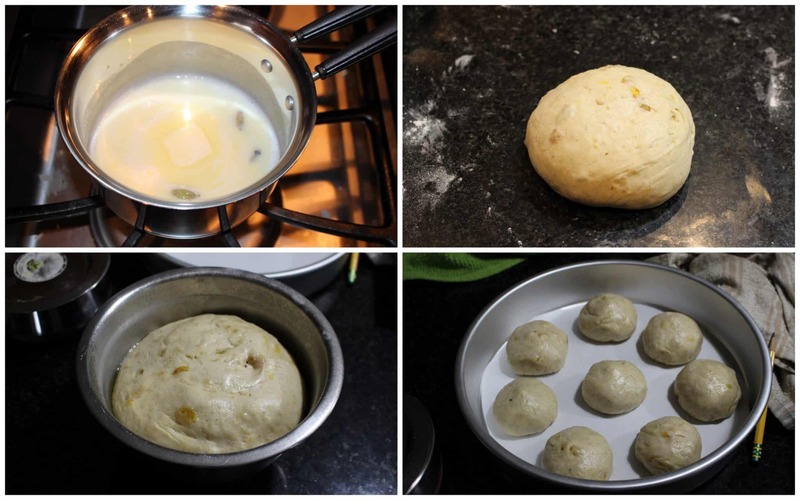 Knead the dough until it is very soft and then place it in a greased bowl. Cover it with a plastic wrap and then a kitchen towel and place it in a warm, draft-free place until it doubles in volume. Once the dough is risen, punch it down gently and then divide it into 8 equal pieces. Roll each piece of dough into a taut ball and place it on a parchment lined baking dish. Using a butter knife, make a deep cut in the shape of a cross on each ball. Cover the dough with a kitchen towel and let it proof again until they are puffy. About 45 minutes to an hour. In the meantime, mix all the ingredients mentioned to make the cross. Transfer the paste to a Ziploc bag and seal it. 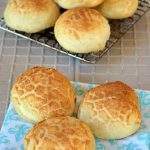 Once the dough balls have puffed up, use a pastry brush and liberally brush the top of the buns with the cream and milk mixture. 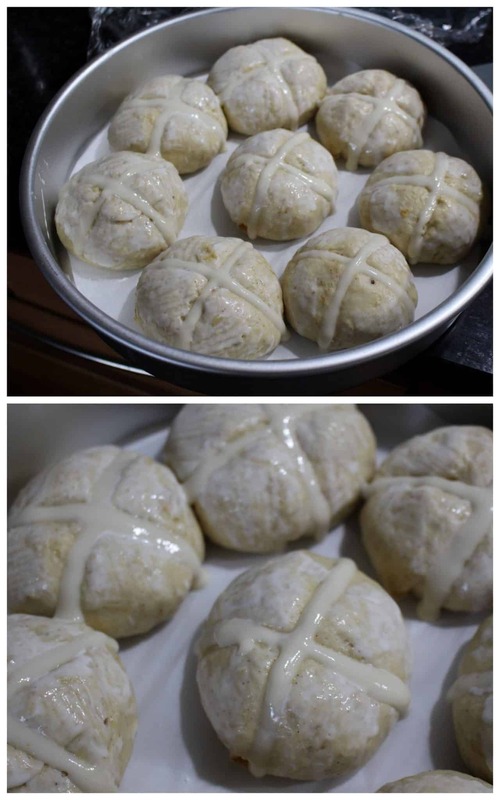 Now make a small hole in one corner of the Ziploc bag with the flour paste and draw the cross over the buns right where we made a cut. Place the buns in the oven for 15 to 20 minutes or until the top of the buns are golden brown and shiny. Keep an eye starting from about 15 minutes as the cooking times vary by the oven. Remove the buns on a cooling rack and serve warm with butter. 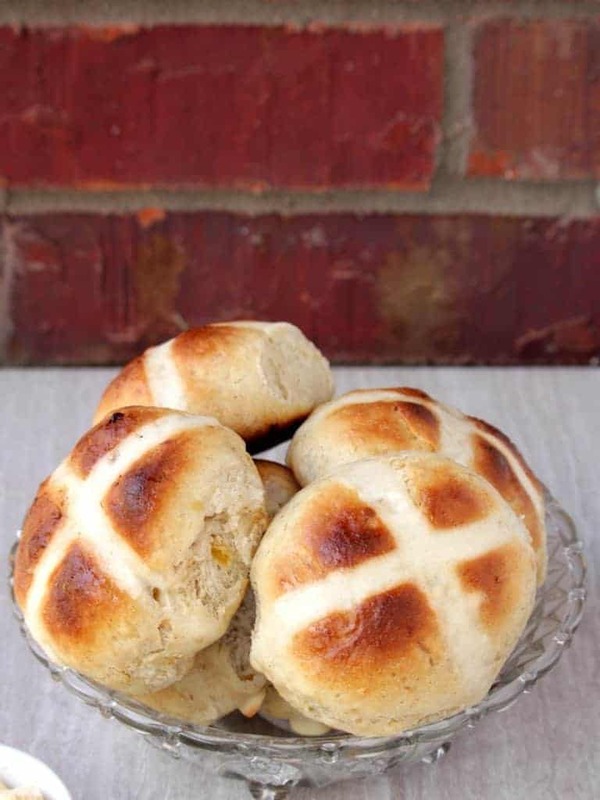 Love the golden hue of the hot cross buns. 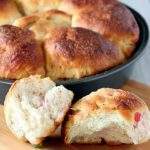 i love the spices you have used in these buns. Ooops I think I didn’t make those mark cuts on the bun..heheh..yours has turned out super Sandhya..good job there! Sandhya, I wish I could taste these beautiful golden beauties .the buns have come out super cool , I am all fida on them , their color and texture both are fantastic ! 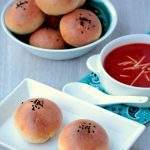 The buns sound flavourful with all those spices! 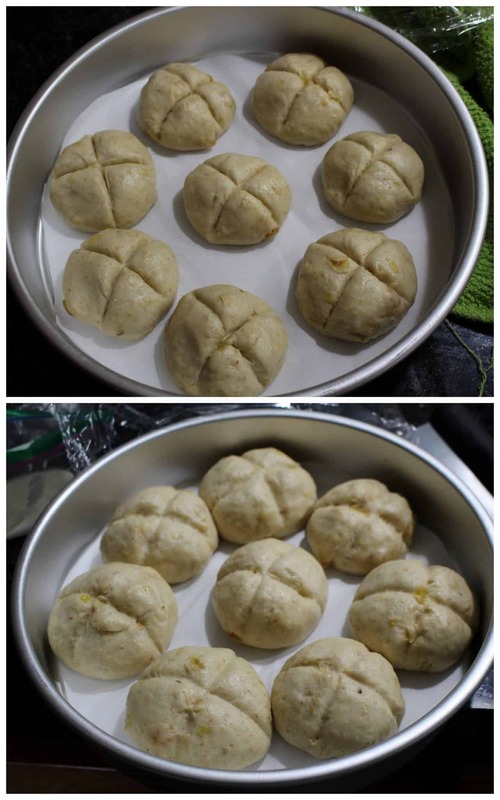 Perfectly crossed buns! Perfect shape and texture.. i wanted to make them soon!! Lovely share!! 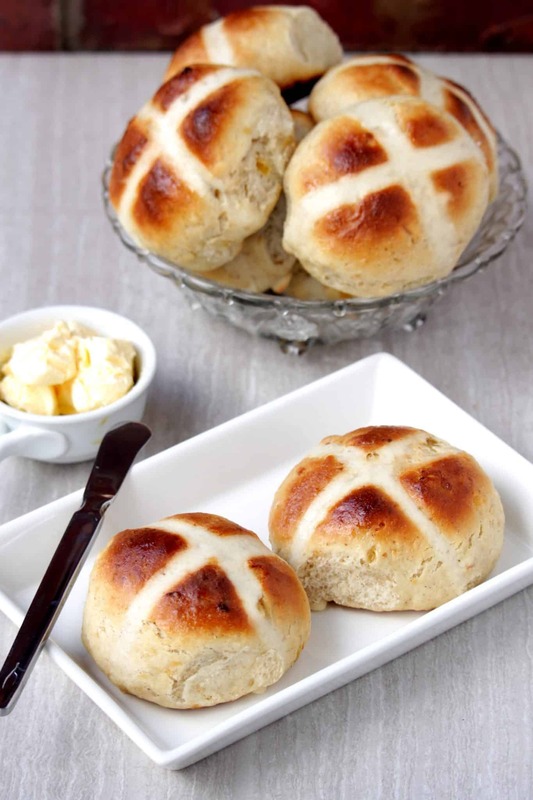 How prefect and super cute this hot cross buns looks. 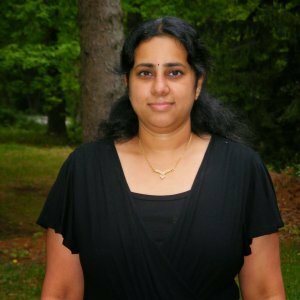 Beautiful baked buns Sandhya, you got them prefectly. wow awesome.. Beautiful love the bright pictures Sandhya.. Hot cross and honey cakes are ruling the day. These look so good. Sandhya you make everything look so easy.. Love the progress pictures. I have seen hot cross buns a bunch but never made them. The design is so cool and you got the perfect browning on the rolls. Your hot cross buns look so nice! I see them in bakeries a lot but I have never actually tried them. 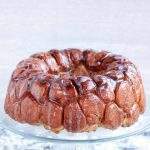 wow you are an expert baker, I have always wanted to learn how to make criss cross buns for Easter thanks for sharing the recipe and the process. Your buns look so nice and fluffy! Removing the egg didn’t seem to do the texture any harm. 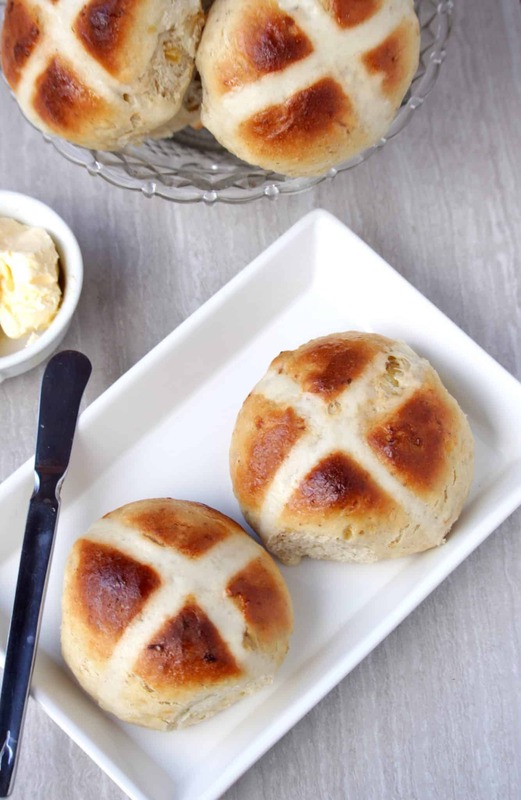 We’ve never made hot cross buns before. Yours certainly do look delicious! 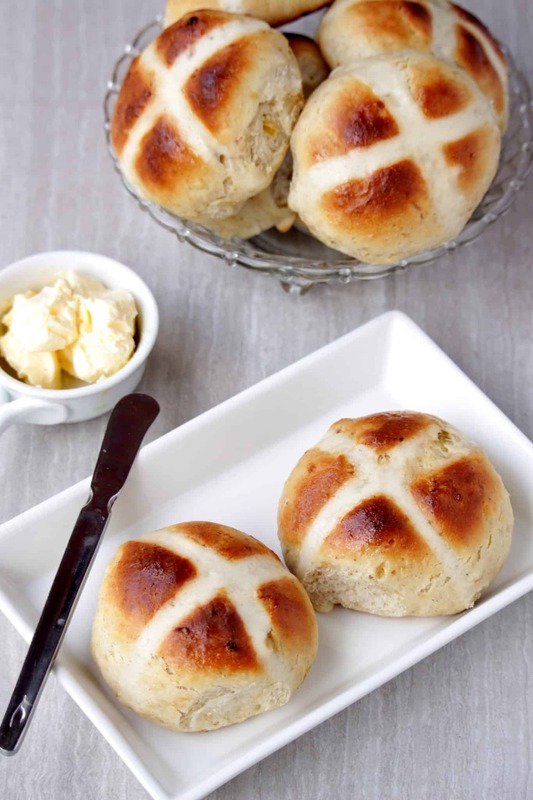 These look like perfect hot cross buns! I have never made them but I’m inspired to by this post! These are so perfect for the Mother’s Day brunch I am going to have to make:) I love a warm roll and these are so pretty with their perfect cross marks! Such pretty buns! I’ve always heard people talk about Hot Cross Buns, but I didn’t know what they actually were. 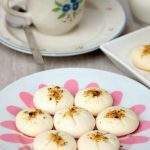 This is a recipe I can make, and probably will, soon! Even I remember that hot cross bun rhyme. That takes me several years back:) This buns looks very perfect and neat. I can almost smell these from the screen. They look fabulous. And love you you made the cross on the inside rather than the outside. I haven’t had a hot cross bun in a long time. They look wonderful and I bet they smelled great when you were making them. I’m from New Zealand and I can totally agree with you – they’re a big deal back home! I haven’t seen them in stores here, so am forced to make my own. I must give your version a try next year! I have always wanted to bake them since ages. You gave me the perfect recipe to try on. Wow Sandhya, those hot cross buns look amazing. Love how beautifully golden they got even without the eggs.